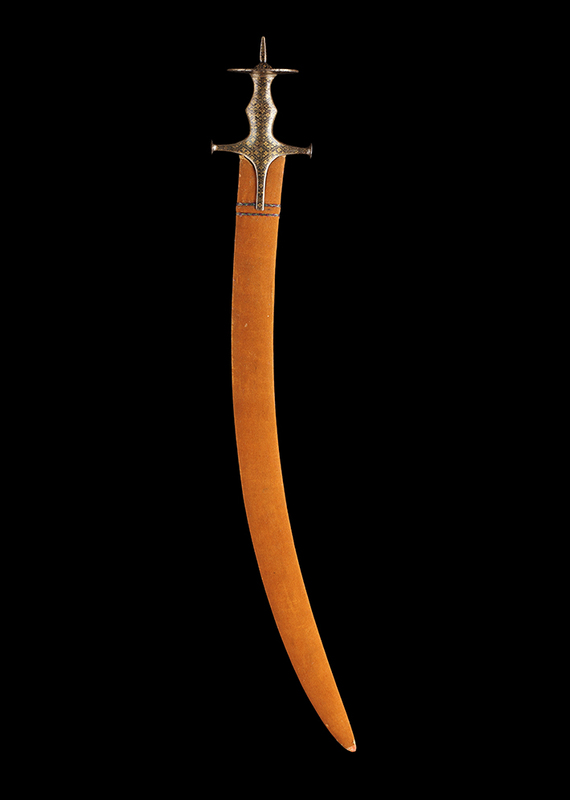 This tulwar’s hilt-form is typical of those made during the reign of Maharaja Jaswant Singh II and is commonly referred to as the Jodhpur type. It is made from steel and has been blued to provide an attractive background to its gold koftgari. This gold has been applied with great precision and delicate elegance, and shows fine quatrefoils, stems and related motifs throughout. The disc pommel has been finished with an elaborate sunburst design, likely a nod to Surya the sun-god that many Rajputs claim descent from. A similar hilt can be found in the Jodhpur Armoury, with Robert Elgood commenting that the goldwork on that example can also be found on objects from Alwar and Jaipur—something that is true for our hilt too. Similarities to a very fine tulwar in the Royal Collection Trust (recently on display at the Queen’s Gallery) can also be noted. This was gifted by the Mahrajah of Ulwar, Mangal Singh, to the Prince of Wales and has a blade made by the master smith Muhammad Ibrahim; it is tempting to think that our sword also has a blade made by his hand. Certainly, the quality of the wootz steel suggests it could have been, with Ibrahim’s blades being renowned for the unusually high visual contrast between the darkness of their carbon content and the lightness of the silvery whirling lines—a contrast also found in ours. Perhaps this hilt was made in Jodhpur and then sent to Ulwar for decoration and blade fitting. The wooden scabbard has been entirely covered with saffron-coloured velvet: a colour that the Rajputs linked with war and martyrdom. R. Elgood, Rajput Arms & Armour: The Rathores and their Armoury at Jodhpur Fort, Niyogi Books, 2017, p.426.